The Mercury News (formerly San Jose Mercury News), often locally known as The Merc, is an American daily newspaper, published in San Jose, California. It is published by Bay Area News Group, a subsidiary of Digital First Media. 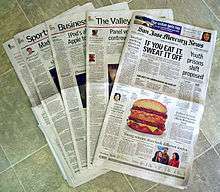 The Mercury News encompasses all other Bay Area newspapers owned by Media News Group, including the Oakland Tribune, Contra Costa Times, Marin Independent Journal, San Mateo County Times, Santa Cruz Sentinel, and 10 other local daily newspapers, each of which are branded as "an edition of the San Jose Mercury News," which accounts for the newspaper's high circulation. Formerly published as the San Jose Mercury News, Bay Area News Group announced in March 2016 that the newspaper would be re-branded as The Mercury News as part of a consolidation plan. The Mercury News launched on April 5, 2016. Sections vary by day of the week, but Business, Sports, and The Valley are standard daily fare. On April 26, 2006 it was announced that Denver-based MediaNews Group would buy the Mercury News. However, on June 12, 2006, federal regulators from the U.S. Department of Justice asked for more time to review the purchase, citing possible anti-trust concerns over MediaNews' ownership of other newspapers in the region. Although approval by regulators and completion of MediaNews' acquisition was announced on August 2, 2006, a lawsuit claiming antitrust violations by MediaNews and the Hearst Corporation had also been filed in July 2006. The paper's local coverage and circulation is concentrated on the entire Bay Area, plus Santa Cruz County, yet excluding San Francisco and Sonoma County, which are thoroughly covered by the rival San Francisco Chronicle. In August 1996 the Mercury News published "Dark Alliance," a series of investigative articles by reporter Gary Webb. The series claimed that members of the Nicaraguan Contras, an anti-government group organized with the help of the Central Intelligence Agency, had been involved in smuggling cocaine into America to support their struggle, and as a result had played a major role in creating the crack-cocaine epidemic of the 1980s. The series sparked three federal investigations, but other newspapers such as the Los Angeles Times later published articles suggesting that the series claims were overstated. Executive editor Jerry Ceppos, who had approved the series, eventually published a column that acknowledged shortcomings in the series reporting, editing, and production, while maintaining the story was correct "on many important points." ↑ Carey, Pete (2014-06-12). "Mercury News announces move to downtown San Jose". San Jose Mercury News. Bay Area News Group. Retrieved 2014-10-19. ↑ "Circulation averages for the six months ended: 9/30/2010". Audit Bureau of Circulation. 2011-04-21. ↑ "Oakland loses Tribune, with paper folded into new East Bay Times". SFGate. March 1, 2016. Retrieved 19 April 2016. ↑ Seelye, Katharine; Sorkin, Andrew Ross (2006-03-13). "Newspaper Chain Agrees to a Sale for $4.5 Billion". The New York Times. Retrieved 2011-02-22. ↑ Egelko, Bob (2006-12-20). "Hearst-MediaNews ruling extended". SFGate - San Francisco Chronicle. Hearst Communications. Retrieved 2011-02-22. ↑ Egelko, Bob (2007-04-25). "Hearst, MediaNews Group settle Reilly suit". SFGate - San Francisco Chronicle. Hearst Communications. Retrieved 2011-02-22. ↑ "Bio". San Jose Mercury News. ↑ White, Dana. (2001-02-24) "For the Birds" Westchester Magazine. Retrieved 2012-01-04. ↑ Ceppos, Jerry (1997-05-11). "To readers of our 'Dark Alliance' series". San Jose Mercury News. Archived from the original on November 19, 1997. Retrieved 2015-02-11. Wikimedia Commons has media related to San Jose Mercury News.